It's May here in North Eastern Ohio and it looks like after a couple of false starts with 80 degree days in March that spring is finally here to stay! So, if you're like me you've been walking through the garage for the past couple of months with blinders on, trying not to notice the mess that has accumulated there over the winter - yes, garage messes accumulate in professional organizer's garages too! Today we're going to use my EASY™ formula to deal with that accumulated clutter in the garage. First, Empty the garage of everything. Yes, that means putting it all out on the driveway, so make sure the weather forecast is on your side. As you pull everything out, put all of the stuff that doesn’t belong in your garage in one area. Next, Arrange the remaining items you’ve removed that will be staying in the garage into categories. Categories I typically use when organizing garages include: Lawn & Garden, Tools, Car Care, Sports & Recreation and Kids Stuff. After you Arrange these items into categories, next Arrange each category into the following categories: Keep, Donate, Repair, and Dispose. Pack up the donations and put them in your car immediately so you can donate them the next time you run errands. Schedule the repair of the items in your Repair pile into your calendar so the repairs actually get done. Finally, get the Dispose items into the trash right away. If you have a lot of dispose items, give JunkAway a call. You should be left with sorted piles of things you are Keeping. Storage: Your next step is to determine how your items will be stored in the garage. I typically recommend like categories of items be stored together to make items easier to retrieve. First figure out where the large difficult to store items, such as a wheelbarrow, lawnmower, and/ or bikes will be stored. Now look at what remains in each of your categories and think about how you use these items and how you want to store them: Do you use these items once a year or on a regular basis? Will they best be stored on shelves or bins? Do they need to be placed out of reach of young children? Can shelves or hooks be added to your walls? Only once you have identified what will be stored where in the garage and how it will be stored should you buy and install any storage products. You’re almost done – Remember that pile of things that didn't belong in your garage that you created at the beginning of the process? Now is the time to put those items away or return them to their rightful owner. Your last step is to put away everything still left on the driveway in its new home and step back to admire what you've accomplished. The flowers are starting to bloom and the trees are budding. The weather is getting warmer and the sun is shining in. Are you looking around your home and seeing the remnants of winter? It's time to put the winter coats, hats, gloves and boots away! Start small if you are shuddering at the thought of spring cleaning. For example, clean out the glove compartment in your car. Remember to keep your registration and proof of insurance handy. Keep your counters clutter-free by sorting the mail into "to-do", "file", and "read" piles. Keep the "read" pile down by placing it near a comfy chair so reading is enjoyable, let yourself recycle old items. Most information is online and you do not need to keep out-of-date books or magazines. Make mealtime more enjoyable by sorting groceries in the pantry into categories - everyday staples, baking, sauces, fruits & vegetables, etc. Once you have a place it will be easier to unload groceries and find items before mealtime. Set a 30-minute timer and go thru a problem closet. Sort items into "keep", "toss", and "pass-on" piles. You will be pleasantly surprised how much you can clear out in 30 minutes. Organizing is all about finding the right home for your things. For organizing help and more time saving tips, stop back at http://napo-ohio.com again! -- Terry Cowans, Reddin' Up, Ltd.
Home office a mess? Pro can sort it all out. SACRAMENTO, Calif. undefined As home offices go, Dianna Lovelace’s work space wasn’t the messiest. But every time the Rancho Cordova, Calif., mother and pastor’s wife wanted to pay a bill, do some writing or work on a project, the clutter crowded out her ability to concentrate. Like many of us, the energetic mom, who also runs a women’s ministry and teaches motivational workshops, could never find the time to get on top of her home-office clutter. And in her otherwise spotless home, it showed. The desk was covered with family photos, piles of paper, bills, school notices. The wall-to-wall shelves were crammed with books, binders, old phone books, family mementoes, magazines, even a wedding bouquet. And the floor? It was a holding station for accumulated household stuff: last year’s Christmas wreath, a bedroom comforter, the vacuum cleaner, Goodwill donations, a bag of to-be-shredded papers and 15 years’ worth of women’s conference materials. “All I want is peace … and to be able to multitask a little easier,” said Lovelace, who admitted that she procrastinated several years before hiring Tonya Piper, a professional organizer. That’s a typical response. “It’s overwhelming for many people. Sometimes they just need permission to get rid of their ‘stuff,’ ” said Piper, a former engineer who has been a professional organizer the past five years. The mantra of every personal organizer: Everything in your house needs its own home, including every piece of paper you keep. And even then, we keep too much. “People like to pile, instead of file,” said Ann Nagel, the Elk Grove, Calif., owner of Organize With Ann, who has seen clients’ homes with paper piled on windowsills, dining-room tables, bathroom floors and just about any flat surface. The most typical undefined but worst undefined place, she says, is the kitchen counter, where papers easily get wet or spilled on. “About 95 percent of what we file, we never look at again. But it’s taking up valuable real estate in our home office,” said Nagel, who turned to professional organizing after 30 years as a legal and corporate secretary. When tackling a home-office organization, there are two necessities: a good filing cabinet and a commitment to purge paper. And an understanding that it’s often ugliest at the start. To begin, spread your piles on the bed or floor and sort by category: taxes, insurance, bills, owners’ manuals, etc. Put a sticky note on each pile as you go. Ultimately, those piles should go into a permanent home inside labeled folders in a filing cabinet. “It’s not rocket science. Everyone has the same stuff, but with their own special needs,” Nagel said. Lovelace already had color-coded many of her women’s workshop files, but they occupied valuable space inside a desk drawer. Because they aren’t used daily or even monthly, Piper moved them to a nearby bookshelf. She turned brown accordion file folders on their sides, facing out, so Lovelace’s rainbow-hued files are easily accessible. Another home organizing tip: Have a single place to store incoming papers. It can be a letter tray, a file folder, a basket or even a box. “If it’s all in one spot, you stand a much better chance of dealing with it when you’re ready to take action,” Nagel said. The McGhee family is scheduled to be on Oprah Show today February 21, 2011 in a show called Miracle Births, Miracle Babies so be sure to watch it! You can also visit the McGhee family on the McGhee Sextuplets Facebook Page. Every January, members of the National Association of Professional Organizers (NAPO) raise awareness in a celebration of Get Organized (GO) Month. 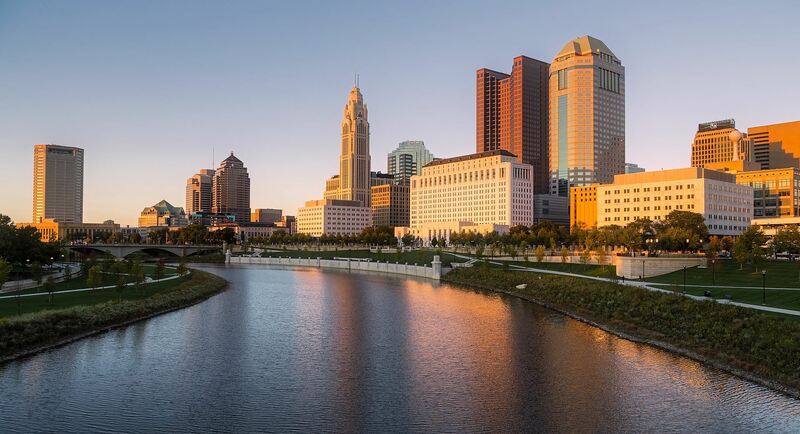 In the past, the NAPO-Ohio chapter members have gotten together to done Messy Space contests, an organizing lecture series, and decluttered non-profit businesses like the Waste Not Center and Susan G. Komen- Race for the Cure offices. This year a request came from the McGhee family in Gahanna, Ohio who needed help in a new home. Mia and Rozonno McGhee became instant Columbus celebrities after the birth of their sextuplets in June of 2010. Friends, strangers, church members, and family have blessed the family, helping them with the never ending daily needs of six babies. They estimate they are using around 40 diapers per day at this point. This means they need lots of supplies on hand. The initial assessment of the family’s organizing needs and budget for the project was done by Ellen Limes . Five other organizers, Susan Sugar, Terry Cowans, Mary Donovan, Debbie McRae, and Melanie Dennis, volunteered to help on a very chilly January day to build shelves and sort baby clothes and supplies in an over the garage storage area. The No. 1 problem that Julie Riber's clients have is paper. They have piles and piles of the stuff. The junk mail, bills, school assignments, magazines and cards just keep accumulating. Riber, a professional organizer who owns Transformare, obviously has a handle on how to deal with the overwhelming challenge. Her office, in the basement of her Orange Township home, is bereft of piles. The room is small but has ample space. Everything has a place. Corkboards with family schedules line two walls; on another, a tall bookshelf holds binders of all kinds. Everything is labeled. On the L-shaped desk are a laptop computer, a coffee mug, several pens and a small U.S. flag. The Dispatch recently talked to Riber about her specialty. Q: Is your personality reflected in this room? A: I'm pretty organized -- even as a kid (I was). I remember being in high school, and a lot of my friends, you'd walk into their rooms and it was pretty crazy -- a lot of clothes everywhere, stuff all over the place. My room was never like that, ever. . . . I've just always been fairly neat. Q: Is being organized ingrained in a person? A: I think it's a combination. Part of it is learned, if you have lived in that environment, and part of it is personality. Some people are more apt to be organized. But different people have different systems. You just have to find a system that works for you. Q: You don't have any piles down here? A: Just this (pointing to books and brochures). I'm going to Disney, and I'm planning. Q: How do you keep this office so orderly? A: Really it starts when you get your mail. Immediately get rid of any junk mail. You probably get three or four credit-card offers at least in a week. Just throw those in the shredder every day. And you don't need a really expensive shredder. Q: What else do you toss? a bill, I take the year before out. Some people don't like to do that, but bills -- like electric and gas and all of those other bills -- you can really get all of those online. And the other thing is: If you ask me to find my 2006 taxes or my son's medical records, I know exactly where they are. Q: Have you ever gotten rid of something you later regretted? A: Not really. Well, actually, there was one wooden train set that I wondered if I should have kept. It was a Thomas train for my son; he outgrew that. But throwing away the plastic ones, I never regret that. Q: What do you have on the bulletin board? A: My son's schedules. If it has an end date, I put it up there -- which, you know, school has end dates. There is always summer; there are always schedules coming out. Right now we have flag football out. Next it'll be lacrosse; after that it will be baseball; and after that we take a break. Q: For an office, this is pretty small, isn't it? What is it, 10 by 15 feet? A: When you move into college and you're in the dorm, or you move into apartments in college, all of those places are really small. I always try to keep it neat. With the smaller spaces,the neater it is, the larger it works. Q: How often are you here? A: I'm down here pretty much all day when I'm not helping people out with organizing. Q: Is that toolbox in the corner an emergency organizing kit that you use with clients? A: I do. I have my tape measure, my stud finder, regular tools and a label maker. Now that's a big deal. Here are scissors, and then just other things like different kinds of screws, different nails and pushpins. These are furniture movers, We use those to move the furniture if it's too heavy. That's what I take with me. Q: So what is in the binders on the bookshelf? A: Here we have business cards. I tell clients that these work really well and not to use a Rolodex, and to use one of these (opening up binder with plastic sleeves of cards.) You can put different cards in it and keep it up to date. This one (pulling out a thick binder) is kids' artwork. People like to keep a lot of artwork, and I know people do, but what I try to do at the end of the year is pare it down. You know, when they have a large project, try to take a picture of it. What are you going to do with a giant piece of cardboard that is probably going to fold up and wilt in the future? Q: Is your computer this organized? A: I try. I try to keep files all in different folders -- so when I get something I just put it in that folder. If I had a bunch of Word files all over the place, I would be crying. The chronically disorganized among us sometimes become terribly frustrated, but instead they could get PO'd That's"professionally organized, - not whatever you were thinking. Across the country and around Ohio, growing numbers of people are taking up the relatively new profession of organizer. They offer their services, for a fee - hence the "professional" part - to individuals and businesses in order to get them on back en track, keep them on time and put them on the road to a less cluttered, less stressful existence. 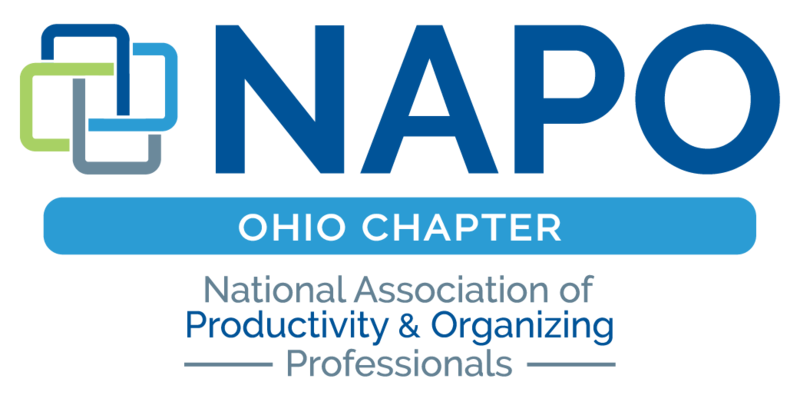 Several professional organizers from central Ohio are working together to establish a statewide chapter of me NAPO, the National Association of Professional Organizers. Based in Norcross, Ga., the NAPO was established in 1985 to "develop, lead and promote professional organizers and the organizing industry." according to its Web site. Membership in the association recently reached the 2,000 mark, which is remarkable. in the view of NAPO president Barry Izsak, given that the 1,000-member milestone was achieved as recently as 1998. "Our membership is growing at its fastest pace ever," Izsak wrote in a recent e-mail to members throughout the United States in which he pointed out that 500 people have joined the ranks in the past year alone. Ohio currently has 48 NAPO members, according to one of them, Terry Trimper Jones of the Worthington area. Around 18 professional organizers have been gathering together in recent months to start a statewide chapter. The association only requires 10 or 11 members to grant chapter status to a state, Jones said. 'I have no doubt that more people will get into the profession as it gets more visibility," she added. One of the goals of a state chapter would be to raise awareness of the burgeoning profession and correct some misconceptions, according to Jones. "When people hear 'professional organizer,' they think you help them with their closets." she said. "It's very rewarding," said Jennifer Studer-Miller of Dublin. "For me it's rewarding because I can work with someone.in two hours and see that a huge weights lifted off their shoulders because they cap see ... light at the end of the tunnel."